RCAM Mobile Learning Classroom brings high tech learning to your campus. Designed for grades 6 through 12, this unique training program introduces your students to the exciting possibilities of advanced manufacturing careers. All you need to provide is classroom space and faculty supervision to assure safety and an adequate student to faculty ratio. Experience: Students experience hands-on learning guided by RCAM’s team of seasoned instructors. Explore: Students explore STEM related skills by building projects like a working catapult. Engage: Students engage in simulated training with high tech equipment like the Vertex 360 Lincoln virtual welder. Excite: The mobile learning classroom opens the door to exciting new well-paid advanced manufacturing careers. 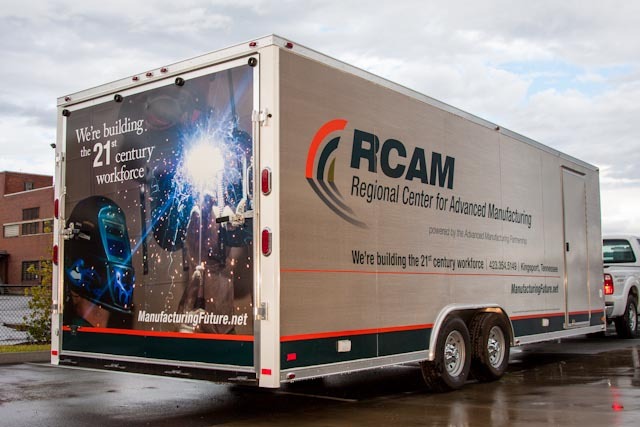 Schedule a visit with RCAM’s Mobile classroom today. Call 423.354.5149 or use the inquiry form here.